Solar energy applications are not just the solar electric panels that convert sunlight to electricity, or the majestic large, spinning, wind turbines we see on the great plains or in offshore clusters. Solar applications also include the use of biomass…..organic materials grown and then processed into fuel or useful products. Biofuels can be used to supplement our energy sources, replace existing petrochemical energy sources, reduce dependence on foreign sources of energy, and reduce the environmental impact/greenhouse gas emissions of petrochemical energy use. Every time the price of a barrel of oil goes up a dollar, it costs the Navy $31 million in extra fuel costs. The U.S. military is very interested in alternative fuels — in particular, the wood-based biofuels being researched and produced at the University of Maine. Check out this amazing process. 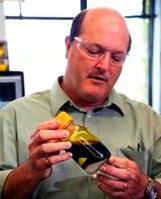 Professor Clayton Wheeler of U of Maine holding a bottle of biofuel made from wood materials. This biofuel can be used as is as a substitute for heating oil or refined a bit more for use as a premium transportation fuel/jet fuel. 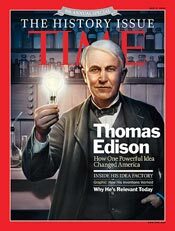 It is fascinating to remember Thomas Edison experimented with biomass back in the late 1920s, trying to find common plant materials that could be processed to become a viable substitute for rubber. 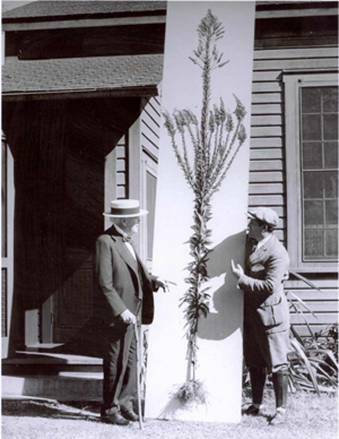 In his painstaking years of work, Edison and his staff evaluated about 17,000 candidate plant species, to develop a giant cross-bred goldenrod plant that could grow as tall as 12 feet; and whose structure contained about 12% rubber. 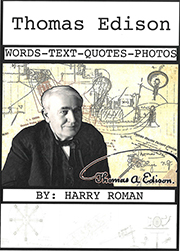 In 1927, Edison, Henry Ford, and Harvey Firestone formed the Edison Botanic Research Corporation of Fort Myers. Plants were collected in Florida and throughout the southern United States by field collectors. 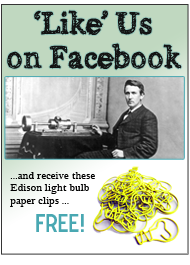 Plants were grown under controlled conditions in Florida and at Edison’s laboratories in West Orange, New Jersey. Edison in Fort Myers in 1931, along with his giant goldenrod plant, later named after him, Solidago edisoniana. 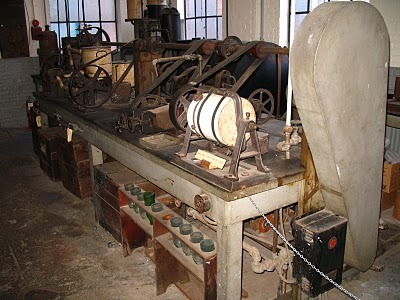 The plant processing equipment Edison used in his West Orange Chemistry Lab to facilitate the extraction of latex rubber from his goldenrod and other candidate plants. 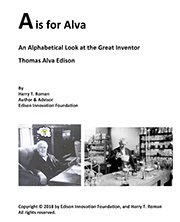 This entry was posted in Inventions Edison Would Love and tagged biomass, biomass conversion, Edison Muckers, edisonia, Inventions Thomas Edison Would Love: Biomass Conversion, investion thomas edison would love, muckers, Thomas Alva Edison, thomas edison, Thomas Edison Muckers on August 2, 2012 by Edison Innovation Foundation. Biomass conversion is the big energy resource for us. Biomass waste can convert into useful fuel with the help of briquetting machine which are invented by briquette press manufacturers India and this is the big invention for industries. The conversion of biomass waste to useful eco-friendly fuel briquettes through briquetting plant can be helpful for environment and energy saving. Biomass briquetting plant working as eco friendly resource and uses agriculture wastage materials as raw materials which are sulfur less and never spread pollution while burning. So due to renewable energy plant it never effect bad to atmosphere.